Good pdf bus maps and timetables for Lucca buses can be downloaded from the local bus company’s website. 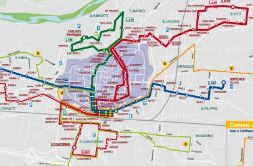 You’ll see on the Lucca city map that some buses (LAM buses) are identified by colour instead of numbers – blu (blue), rosso (red) and verde (green, pronounced ve-r-de). On the same website are bus maps for Viareggio and regional public tansport maps that include bus routes between Lucca and Pisa, Firenze, Viareggio and the mountainous Garfagnana region to the north of Lucca.